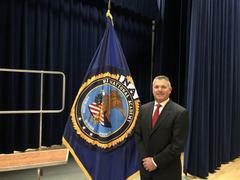 The Pomona Police Department is proud to announce the graduation of Lieutenant (Lt.) Steve Congalton from the 275th Session of the FBI National Academy in Quantico, Virginia. Lt. Congalton graduated from the 10-week training program on Friday, March 15th. This National Academy consisted of law enforcement officers from all 50 states, international countries, military organizations and federal civilian organizations. Internationally known for its academic excellence, the National Academy Program is regarded as the premier law enforcement executive training course. The FBI Academy offers ten weeks of advanced communication, leadership, and fitness training for selected officers having proven records as professional law enforcement leaders within their agencies. Lt. Congalton began his career with the Pomona Police Department in 1996 and currently oversees the Investigative Services Division.